Happy! 節約生活 in アメリカ: $1.50 off 2 Delallo Whole Wheat Pasta Coupon + $0.75 Ibotta Cash Back at Whole Foods! 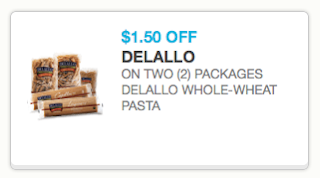 $1.50 off 2 Delallo Whole Wheat Pasta Coupon + $0.75 Ibotta Cash Back at Whole Foods!